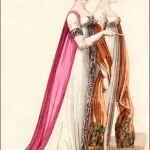 La Belle Assemblée, March 1809. 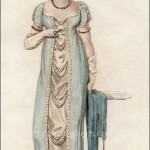 I find this image interesting as it is bit dowdier than usual for an evening full dress. 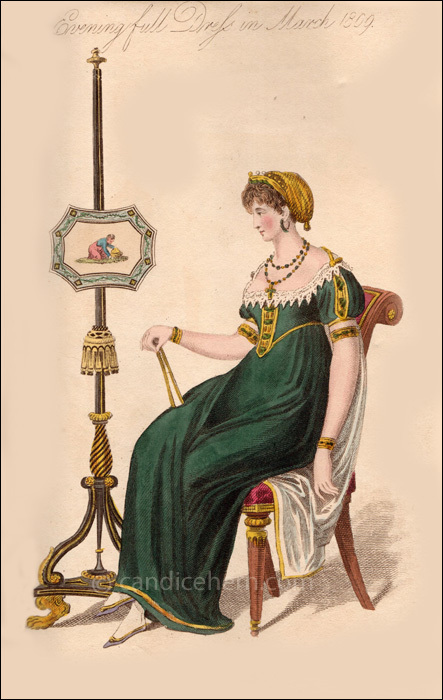 Rather than a young fashionable woman out for a fabulous evening, she looks to me more like a chaperone or matron who sits near the fire to stay warm (hence the fire screen beside her). She wears a parure (ie a matching set) of what appears to be gold and emerald jewelry. 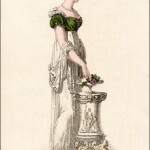 Note that she wears bracelets and armlets, both of which were almost always worn in pairs. The earrings are very modern-looking hoops.